Life began for me on the 22nd May 1912, but I can’t remember that, but it seems I was born at home, which was 17 Glass Street, Burnley. I had two elder brothers, David and Leslie, then came me, then Bess and Albert. 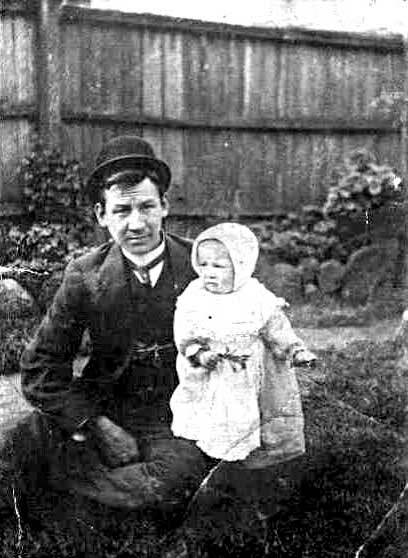 My father (pictured left, with baby Myrtle) worked at Sunshine Harvester Works at Sunshine. I remember a few things of that time; we had a small terrace type house and the side entrance was closed in like a long verandah and us children spent a lot of time there. I remember when wireless was broadcast we all went to a neighbour’s to hear it, the highlight of that outing was my mother having a pair of black stockings to wear. I and my brothers and sister went to the Burnley Primary School, about 15 minutes walk from home over the railway line, there was a bit of quarry near there. After we got to 8th grade, Bess and I then went to Collingwood Domestic Art School in Vere Street, Collingwood. We had to go by train, but sometimes near to Xmas or a birthday we would walk there to save the fare. My father got paid on a Thursday, and most Thursdays we were waiting for him to get home then we would be sent to a corner shop for something for tea. We always got concentrated milk that was available then. One time my mother got some outdoor (outsourced) work from Balls in Richmond and sewed men’s flannels on a treadle machine. Every year the big outing was Henley on the Yarra, we used to walk there. Bess and I would have a new dress and we would stay for the fireworks; we were always on the Richmond side of the Yarra where it was free. After Collingwood school I had about six months at Bradshaw’s Business College, which was over the river where the Concert Hall is now. I learnt, or tried to, shorthand and typing; not very good at it. After that I got a job as an office girl at Eastaugh Knitting Mills at Richmond, then came the depression and I was out of work. So were all of us except Bess, she had a job at a millinery. I used to spend some of my time in the room Bess and I had listening to a crystal wireless set. We could get soup and some clothes down at a soup kitchen. While at Glass Street one year we had a horse and floating rail which we went out to Craigieburn at the 19 Mile road and would get a lot of mushrooms and rabbits (ferreting). We used to leave very early to get there and give the horse a spell. One day at home it hail stormed and the horse played up in the small back yard. Bess I and Albert used to play together in a humpty house we built in a corner in the back yard. Albert at one time wanted to be called Rose as he was with us girls and thought he ought to have a girl’s name. We moved to 33 Robbs Road West Footscray to be nearer to Sunshine. The house was £450. In these days I was about 15, and I remember how they could have had the corner house or the one next door and I told them to take the corner house, as we could have a side gate. We used to go to Tooradin for Xmas holidays in that time we had a Phantom Cart which had seats under the floor and some seats facing those, then slung a chaff bag under and carried some gear in that. We camped on the river there, we travelled along the Nepean Highway and had to walk up many hills to save the horse. It took all day to get there. One of the games we played was to get one penny chocolate guns and see who could make it last the longest. We got plenty of rabbits while there and some fish. After I tried to get other office jobs but I wasn’t good enough, so I got a job as a machinist in Flinders Lane on piece work. I made 2s 6d the first week, you got paid for each article. Anyway I managed to get better but it was hard and so I went from job to job until I worked for a firm in the “Age” building, the last job I had there as then I got married to Leslie Lucas on December 2nd 1939. We were to go on our honeymoon by motor bike and sidecar, but at the last moment there was engine trouble so we had to loan our Grandpa Lucas car for the week. 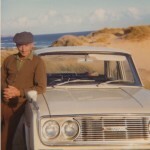 We set off being very careful of the car; we stayed the first night at the Majestic Hotel in St Kilda then had a cabin in White’s Caravan Park, Lakes Entrance. When we came back we had a couple weeks with the Lucases at 100 Cross Street, Footscray, then got a room near Newmarket Sale Yards. After that we got a house in East Malvern. Les was a carpenter and he got a job being a maintenance man in Myers, then in Coles for awhile. He used to work overnight sometimes. We let half the house to pay the rent to a couple with a small girl named Joan Ann. 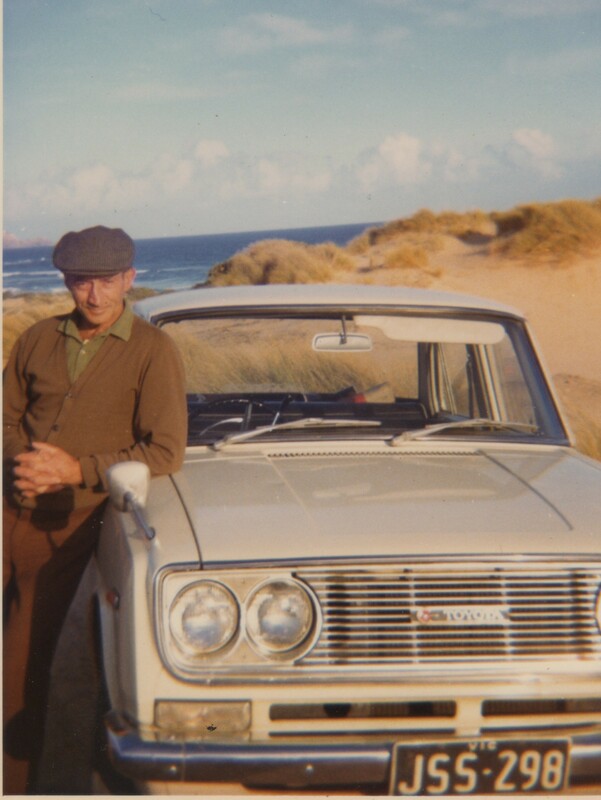 Then Les got a job on the Hydroelectric Co on the Bogong High Plains, so we went there in an old Chev truck which boiled at every hill. The idea of a truck was that we could live in it, plus a tent while we were there, which we did at Yarrawonga. On the creek there were lots of other couples doing the same thing, either they had hessian huts, some of several rooms fitted out. Bess came up on a holiday. Her and I used to go fishing and got some small red fin. Then we had a surf up to Bogong where Les worked with the baker. We were there about eight months. Les had shingles while there and we had to take the old Chev up the big hill to Bright to go to the Dr. Then Les got a job to build a house in Yarrawonga township, which he did, and Stan Lucas came up and did the chimney. We moved to Corryong for another job making a cow shed, then after that to Yackandandah. 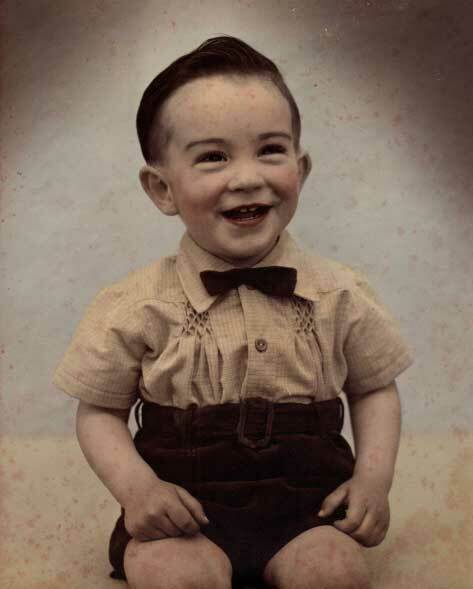 At that time I got pregnant with Janice, so we moved back to Melbourne and got the house at East Malvern. I booked in to a lady doctor in Collins Street and was to go into the St Vincents Hospital for the birth. I was admitted a week before because of blood pressure and kidney trouble, where I met Nell (she had had Jill). We were then in Malvern and the war was near, so Les said after I make a cot for Janice I will join up, so that’s what happened. 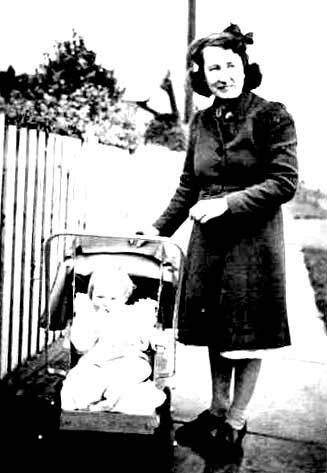 He shifted me and Janice (in the pram at left) back to 33 Robbs Road and went to Bandianna for training. After that he was posted to Mt Isa then Alice Springs in the Transport Division. I got a job at the ammunition works in Footscray, shiftwork. I used to ride my bike in most times as it was an awkward place to get to. After that I got a job in the aircraft factory at Fishermen’s Bend working on the instrument panel of the Beaufort Bombers. 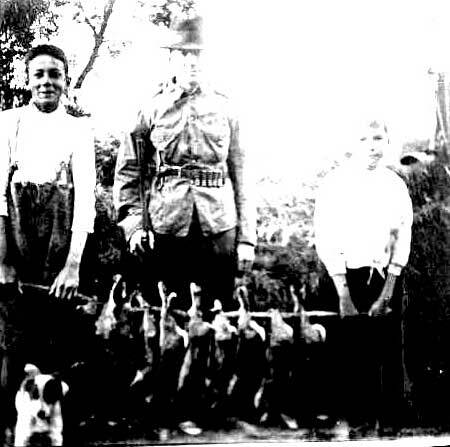 Les was up at Darwin; he was away over a year. Janice was walking when he came back unexpectedly one day. He was at Seymour & went AWOL to come & see us. After he went Janice said: “I like that man.” Les had leave off & on then was posted to an island. I was then pregnant with John. Near the end of my pregnancy my father was killed on the road. He had a small motor bike and used to go to the market to get vegies and had run into the back of an American army truck and had head injuries – passed away in the Melbourne Hospital. About four weeks after that John was born. Uncle Dave drove me in. Les was then up at Mackay. I went to the St Vincent’s again. Dave told me to go in there and have a ‘rabbiter’. Les got leave when I was still in hospital. Nell and I kept in touch. Her mother had a sandwich takeaway food shop in Carlton, and her and I took Janice and Jill into a dancing class every Saturday. Grandma Lucas minded John for the afternoon. We also had the usual outing to the Botanical gardens. Janice started going to kindergarten in Kingsville; I was going down to get her one day when the announcement that the war had ended came. A garbage man told me, so it was great news. While I was at Robbs Road I saw a notice in the paper of land for sale at Rosebud, £25 a block, so as my mother was busy I took Jan and John with me to Melbourne to try and get where the land was. I did that and the estate agent wanted £2 deposit. As I didn’t have the money, I rang Nell at her shop near the Victoria Market; she lent me the money and I took it to the agent, on condition that I would go to the office on Monday, so I put the deposit on three blocks in 1st Avenue, Rosebud. It was a very hot day when all this happened, so it must have been January or February. When Les got out of the army we went to live in 1st Avenue. Les built a big garage and so we had that while he built the house, which took about a year. While we were there Peter came along on November 12th. We had some neighbours back to back with us, they were in Thomas Street, they let us use their bath when they had lit their copper, mostly on a Friday or Saturday. They were Ava and Denis Stewart and their two children. Beginning again: As I write it is 14/09/1996, so I have a lot to catch up on. In those days everyone had slide show nights. We got friendly with the Burnham family, as Les was very much interested in fishing and the Burnhams were an old fishing family, and they had a fresh fish shop out the back of their house and sold fish from there. We went to Rosebud in 1946 straight after the war finished, then Les bought a fishing boat and spent his time fishing and doing odd jobs in between. Then we got the idea, with Ava and Denis, to build a work shop on one of the blocks of land and we went into the business of sewing dresses. Ava had been in that business before they came down to Rosebud. We had eight sewing machines. But it was a failure, so we gradually got out of that as we had to travel to deliver the goods to Melbourne and get the material. While that was going on the group of girls had a Tatts ticket between eight of us and we won first prize of £25,000 and each got about £3000 each and most of us bought a new car. Gwen Whitacker was one of us and her sister was another. We bought a block of land in Thomas Street which was back to back with one of us and Les built a house on that and we let it for awhile. Viv and her family were one of our tenants straight from the migrant ship. Les was then more into fishing, and one night he had a stroke and was in bed for three weeks. After he got over that he went back to fishing, but being very careful until January 8th 1954 when he had a fatal heart attack. Nell was down with us at the time having a bit of a holiday. She was a great help to me. The Burnhams were also a great help, and Roy and Mary lived in 2nd Avenue so I saw a lot of them. They had eight children, so there was always something to do to help Mary. Then they moved to Boneo Road. Every Anzac Day they would have a family gathering and we used to go along with them and go somewhere where the sisters could join in too. Emerald Lake was a favourite place. Stan was still living with his father at the fish shop, looking after him, as he had cancer. 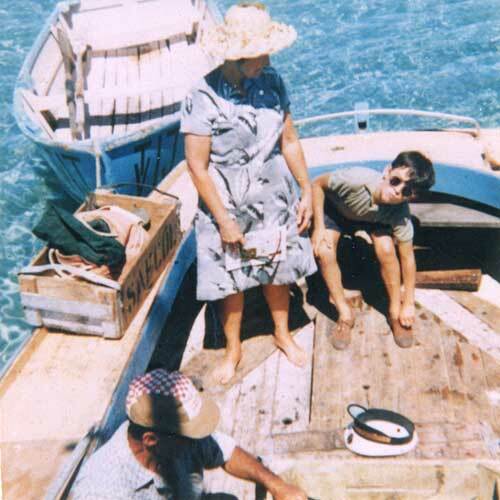 One year I took my mother for a trip to Adelaide and went on a boat trip up the Glenelg River on a house boat for four days, and Stan looked after John and Peter while Jan went to Mable Boulds, who had a daughter the same age as Jan. Then Stan and I got married on 2/3/1955 (the picture at right from their wedding day). 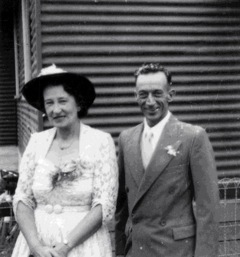 We went to New Zealand for the honeymoon and Bess and George minded John and Peter and Jan stayed with Doris and Vin. After we came back Stan was still fishing and then Stephen came along (at left, 2 years old). We had a round the world trip in 1962, sailing by ship to Europe, then America and home. After then we got the land at Main Ridge and planted apple trees. But it was a lot of work and the apples were the last to ripen and get to the market so we got the low price and lost out, so then we had a chicken shed – and more hard work. Then Stan had an angina attack so he had a lot of pain. Jack Bates used to come up and help me pick apples and feed the chooks, so we sold that and came to 2 Grenville Grove in West Rosebud and Stan went back to serving in the fish shop. 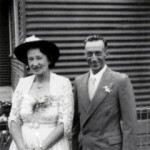 Then he could do it no longer as he was in and out of Heidelberg (repatriation hospital) for a couple of years with a complaint they said was amiloidosis on the liver, and passed away on the 14/3/1983. After selling Main Ridge we came back to Rosebud, and lived in the fish shop house for a while before finding the West Rosebud house. Mum was very active all her life, as you can see, but even in her 70s and up to about 80 she was playing golf and later bowls and enjoyed those. She was also in a walking club, and would be clocking up kilometres that would tire someone half her age. Mum was also still driving herself around up until she moved away from Rosebud. She held a firm belief also that a dip in the salt water was enlivening, and would walk down to the beach to do just that when the temperature allowed, or if not, then to have a paddle and a walk along the beach. 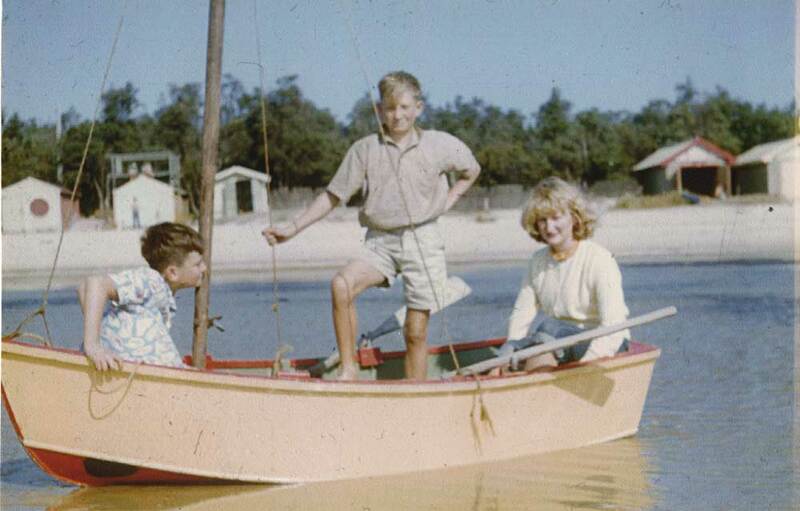 Below is Myrtle, Stan (starting the engine) and Steve in the 24-footer, now named ‘Sara Luisa’ and moored at St Kilda.